Is House Lifting Worth The Cost? Every year, there are thousands of homes that suffer damage due to sinking. This happens because of a variety of reasons, including softening of the ground in low-lying areas, erosion, the breakdown of foundation materials, and so forth. Many of these homeowners have to make choices about how to save their homes, or whether to rebuild them. Before deciding on house lifting for your property, it’s important that you talk to local professionals about any special considerations that might complicate the process in your area. When your home is a good candidate for this process, it can help to restore a building’s livability for decades to come without having to engage in the pricey and drawn out process of tearing down the property completely and erecting a new home on the site. Often, there are still substantial renovations that come with house lifting, and the investment can be a major one for many homeowners, but unless the property faces some truly unique challenges, it still preserves quite a bit of the original construction. More importantly, though, it doesn’t just preserve building materials and lower costs, it preserves your home as your home, something that simply isn’t possible when you have to reconstruct a house completely. While you might find it easy to see to the floor plan and color-match walls and carpeting, it’s not the same house after. When you decide on house lifting, you preserve your home instead of simply preserving the value of your property. 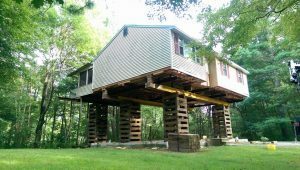 Between the sentimental reasons and the likely cost savings, it’s a good idea for any homeowner encountering problems with sinking property to talk to a contractor who understands how to lift a house. Specific insight into the needs of your property is going to give you the information you need to make the best decision for your home and family, so make sure you contact someone soon if this is an issue you are facing.